While wearing contact lenses everyday is certainly flattering, there are certain days where you just want to let your eyes breathe (oxygen is so important for your eye health!) and wear glasses instead. However, much to my dismay, this means sunglasses are out of the picture because as soon as my glasses are off, I’m blind as a bat (my prescription is -5.5!). A lot of people I know, like my dad, my brother, and his girlfriend don’t even own sunglasses (to my horror!!) because they can’t wear them. They are severely short-sighted and full time glasses wearer, therefore as soon as they take their glasses off, they’re blind. So sunglasses are out of the question! It’s fine if you’re not fussed about sunnies, but if you’re like me, sunglasses are a fashion statement. They are my favorite accessory second to shoes (yes! I love sunnies more than bags!) and I am not even slightly ashamed to declare I have over 100+ pairs of sunnies in my drawers and every crook and cranny of my bedroom. Being a sunglasses buyer for David Jones for the past 18 months didn’t help either. All the samples and gifts I received from suppliers at that time added to my already slightly concerning addiction. Anyway, back to my story, this was what drove me to explore the possibility of Transitions® lens in the first place. I’ve spent the past 8 years wearing contact lens almost every single day, and sometimes even wearing them to sleep! Anyone else guilty of this? Optometrists always recommend that you take them off as soon as you get home, and have at least 2 days a week where you give your eyes their much need oxygen by not wearing contacts. Needlessly to say, I didn’t have a bar of it. And now I am definitely feeling the effects as my eyes have taken its toll. Lately I have been experiencing red, burning sensations in my eyes, and they feel really dry, even in the mornings, after a good night’s sleep. I knew I needed to do something, so I started giving my eyes more rest and wear glasses more often. It got to the point where I was wearing glasses to work events (which I never used to do)! That was how desperate I got. However, all these glasses-wearing made me miss my good ol’ sunnies. Not wearing them made me feel naked especially when I’m out in the sun. So when Transitions® lens contacted me to see if I wanted to try out a pair and share my experiences, I was beyond excited. What good timing, I thought! It was as if they knew my trouble and came up with the perfect solution! Having tried them out for about three weeks now, here’s the low down of everything you need to know about Transitions® lens, and whether you should be getting them too. As a disclaimer, I’d like to mention that this post is sponsored by Essilor, but as usual, all opinions are my own. With that, keep reading to find out my experience with Transitions® lens and shop my current picks for frames that would suit your Transitions® Signature Style Colours. I still remember how I excited I was walking into Lifestyle Optical at Chifley Plaza. Stu was very friendly over the phone so I already felt welcomed and understood. After initial exchanges of greetings, I was ushered into the optometrist room where she performed a bunch of standard eye health tests on me. As it turned out, she confirmed my belief - my eyes are dry and irritating, and I need to give my eyes a good rest and plenty of oxygen before it gets worse. We also talked about possibilities of laser surgery (I have thought about doing them for a while now! ), but due to my thin cornea, surgery poses a higher risk for me. We decided to wait a few more years when technology improves before considering this option again. For now, I’ll be relying on Transitions® lens as my alternative. Then it was time to pick out my frames. I am the least decisive person you’ll ever meet, so naturally I had a hard time picking out the perfect one. Thank god for technology, I narrowed it to two options and had a poll going on Instagram Stories where my readers could vote and help decide. What a time to be alive! If you were one of them who voted on the day, thank you! I went with you guy’s suggestion - the Celine’s! Lastly, I had to select my Transitions® lens colour to go with my frames. They recently launched four new colours - Amber (brown), Emerald (green), Amethyst (purple) and Sapphire (blue). I was tossing between Emerald and Amethyst, and decided to go ahead with Emerald for that green, old school Ray-Ban look. I also think it’s the most classic colour out of the four, that I know I’ll be able to wear for years to come. About two weeks later, I got a phone call telling me that the glasses are ready to be picked up! I was overjoyed and couldn’t wait to rush in to collect them. On collection day, Stu helped me adjust the frame to fit my face. As all Celine’s go, they are certainly oversized. I happily ditched my daily contacts that very minute and wore the glasses out to dinner with some friends. They all commented and loved it! It’s been about three weeks now since initial collection day. I must admit that I still wear contacts every now and then as I get used to the weight of the new glasses on my face, but they are slowly and surely forming part of my daily wardrobe. There is a stigma with Transitions® lens that is reserved for the older generation, at least that was my initial opinion on them, and I’m sure many of you thought the same too. However, I soon realised that it wasn’t the lenses that were ‘old school’, it was the frame. If paired with the right frames, they are no different than wearing a cool pair of sunnies, really. The Celine frames I chose were initially sunglasses, which they pop the lens out and made them into Transitions® lens for me. When I wear them outdoors, they look just like any other pair of Celine sunglasses, and when indoors, they look like I’ve been super creative and turned my glasses into prescription ones. 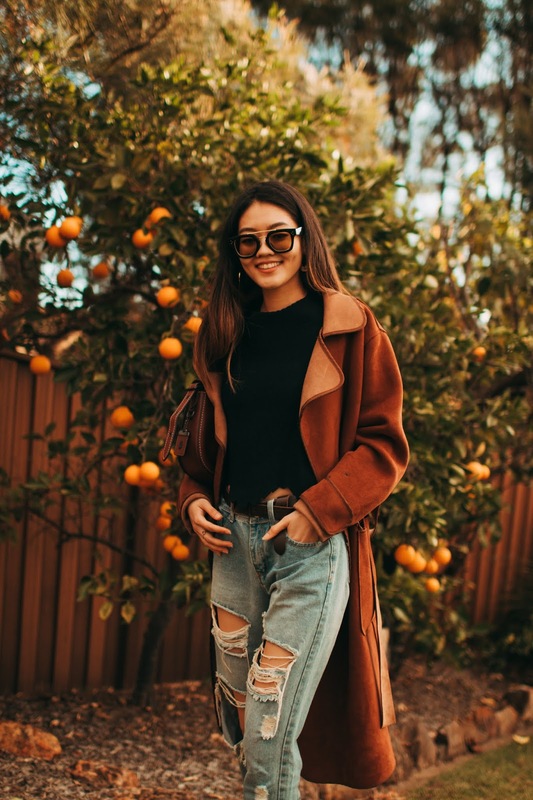 I absolutely adore them because they are the kind of glasses that go with everything in my wardrobe, so the stylish factor is a no-brainer yes tick for me! You might also have noticed that the tinted sunglasses are a trend these days, with brands coming out with various colours of the rainbow, so the Emerald lens was the perfect trendy accessory. I was pleasantly surprised to find that they transition seamlessly from indoors to outdoors and vice versa - it feels like magic and you don’t even notice it! The convenience factor also felt like magic to me. No more exasperated screams of “I forgot to bring my sunnies!! !” (my boyfriend will recognise this scenario all too well) or desperately searching for your sunnies in your bag as soon as you walk into the sun - as they’re already on your face! One time I thought I lost my sunglasses and was upset for a whole hour, only to get home and find it hanging on my shirt collar. None of that problem with Transitions® lenses! 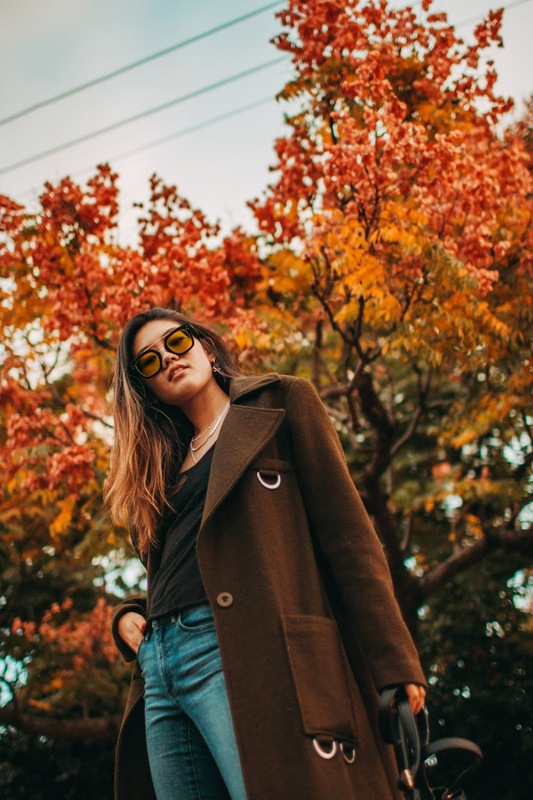 As for those of you who are full time glasses wearer - the convenience factor will be even higher for you, as you’ll no longer need to switch between prescription sunglasses and normal (clear) glasses. Win-win! For contacts wearer like myself, Transitions® lenses gives your eyes a chance to rest from contact lens, which provides the necessary oxygen flow to your blood stream in your eyes. This is definitely a long term health concern and should not be treated lightly. Glasses wearer? Transitions® lenses protect your eyes from UV rays so no more squinting! Which I’m sure you’re all too familiar with. When I learned more about the benefits of Transitions® lens, this was the one that sold me. When outdoors, they provide UV protection (doesn’t work in cars though, because windshields already block UV rays). And when indoors, it has the added benefit of reducing potentially harmful blue light from devices (phones, laptops etc), which normal glasses does not provide. As I’ve said before, I’ve only lately realised the importance of taking care of your eye health as a long term investment. You only have one pair of eyes that will need to last your whole life - take care of it! I also believe that to be successful in life, you’ll need to maximise the use of all tools available around you that aids in helping you achieve more everyday, to be the best version of yourself. We are so incredibly blessed to live in an era where technology like Transitions® lens is smart enough to help block UV rays and blue light which help reduces eye strain and fatigue indoors. It also lessens glare by regulating the amount of natural light you’re exposed it. With tools like that available at our fingertips, it’d be silly not to utilise them to our advantage, and invest in our long term health goals. I like to compare this to Invisalign. If investing in Invisalign is for your long term oral health (helps your teeth align so food gets stuck less in your teeth, with aids in better oral hygiene etc), Transitions® lens is investing in your eye health (protection of your eyes for the long term). I also discovered through the optometrist that my lenses were more expensive due to the fact they were custom made for my prescription through a ‘grind’ method – most people’s lenses are ‘stock’ which can simply be cut to fit the size of the frame, so of course are a little more affordable. This is starting to get technical though and I’m no expert - you should ask your optometrist about stock versus grind lenses as they can tell you what is needed for your eyes. In saying that, good things don’t come cheap. At the risk of sounding like a broken record, this is an investment for your eye health, and for a grand or more, I think it’s worth the money compared to the cost of surgery when something DOES happen to your eyes (think cataract surgery, etc!). Prevention is ALWAYS better than cure. All in all, my experience with Transitions® lens is a positive one. I’m very happy with them, and would totally recommend them to my dad and younger brother, which is why I’m recommending it to you guys. Depending on your lifestyle and location, especially if you live in Australia or in a tropical country, it’s definitely worth the investment. Australia is notorious for our harsh UV rays. We put sunscreen on our face daily and on our bodies when we go to the beach, so why don’t we protect our eyes when they are just as exposed to the sun every single day? Eye health is so overlooked but so important. We only have one pair of eyes. Take care of them as you depend on them for the rest of your lives! Let me know what you guys think of Transitions® lens. Have you tried them or know anyone who has? Are you convinced now or do you still have reservations? Would love to hear your thoughts and have a discussion going on! Best Blogging Gadgets: I Swear By These! 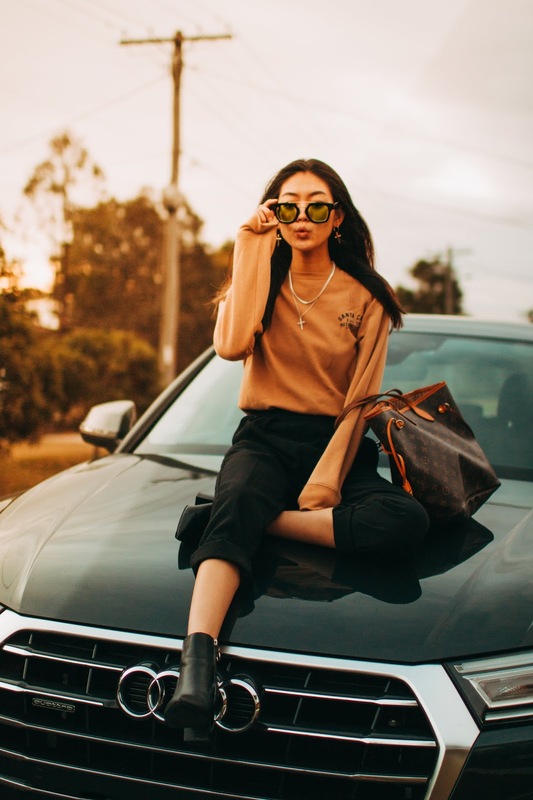 Some of you may know that I've recently quit my full time role as an assistant buyer at David Jones to become a full time blogger/ content creator! In the midst of this, I'm also doing freelance styling and digital content creation, whilst hopefully launching a store later this year (keep your eyes peeled for that one!). In light of this, I've partnered up with Catch.com.au to share with you my top 10 best blogger gadgets that I swear by! So either you're a beginner looking to dip your toes into the world of Blogger/ Instagram, or a seasoned content creator ready to take the plunge to turn your passion into a full time career, I hope the little tips below help! I have used both - both have amazingggg photography cameras (I mean, let's be real that's all we care about, right?). I personally prefer the iOS system (living for the blue iMessage bubbles), but if I had to use an android, Google Pixel would be my absolute #1 choice. I'm currently alternating between the two in terms of taking photos. Google has great low-light camera (think event/ concert photography), and especially amazing for detailed flatlay shots (such as your morning coffee or work desk situation), however I find the iPhone's tone-mapping a lot softer & less "saturated" in portrait shots. In terms of storage size, get the biggest one available! It's a few hundred $ more and it'll save you the headache of running out of space in the long run, which can be incredibly frustrating! Since working freelance, I've been using cafe's, co-working spaces, and public libraries to access free wifi. This means lugging my laptop from work to meetings and sometimes to events! For this reason, the lighter your laptop, the more ideal it is for transporting between locations. My Macbook Air has served me since my good ol' Uni days, and continues to be my greatest tech companion (second only to my phone) in terms of work. I chose the 13" for the SD card slot, but in hindsight, I'd go for the 11'' for ease of and the lighter weight, and use a USB to SD card reader cable instead. Okay, not technically a gadget, but you're reading a fashion blog!!!! Of course I'm going to include my favorite work bag! It's called "Neverfull" for a reason - it literally holds everything. My 13'' Macbook, two water bottles (drink plenty of water folks! ), camera, phone, notebook, laptop charger, iPhone cord, lunch, wallet, makeup etc. The list goes on! I have the Monogram print in MM size, which I think is perfect for day to day use. Unfortunately Apple stopped selling these (only refurbished versions), but I love using this at home!! It's soo nice to see photos blown up on a big screen especially when you're editing on Lightroom. Even replying to emails feels more 'luxurious' on a big screen and a mouse. Sometimes it's nice to take a break from your laptop! Okay the biggest question of all time.. "what camera do you use?" Girlfriend, you asked for it and here's the big reveal! Brand-wise, I find Canon more intuitive to use than Nikon, and have stuck to it since. I've also tried Olympus in the past and to be honest, I was highly let down. It's a good looking camera and super aesthetically pleasing, but for the quality of pictures, I'd much rather resort to my iPhone or Pixel. One brand on my wish list though, is the Leica. Petra from Pepa Mack uses it in her photos and they always look incredible! In terms of the body, I don't use anything super fancy, I used to have the Canon 650D but I have since upgraded to the Canon EOS 70D Mark II. I have two lens that I go in between: 50mm is great for portraits (that bokeh!! ), whereas I love the 10-18mm for adventure/ travel photos and flatlay shots. It's a wide angle lens so gives you almost a fish eye effect. I love this at home! Not so much blogging-specific, but I love using it to get dressed quickly in the morning for my meetings or just getting out of the door in time. It's trans-seasonal autumn weather in Sydney right now, so I often get dressed according to the temperature. Yelling "Hey Google, what's the weather today?" from across the room whilst doing my makeup saves me a few minutes while I decide what to wear in my head! I realise how ridiculous this sounds as I'm typing, but technologies were invented to improve our lives and I'm determine to make the most use out of them! Ahh, what a world we live in. PS: The Google Home Mini is super cute too! I have both the original Home, and the Mini in Charcoal. Out of everythingggg I suggested on this list, this is one that's the least obvious but I'm most proud of. It's a handy little tool that essentially connects your SD card directly to your phone, so you import photos from your camera right-away for instant editing on VSCO or Snapseed! It's perfect for when you're meeting deadlines, or editing on-the-go. If you prefer editing from your phone rather than on Lightroom, this is a life changer. I personally don't have this, but it's something I find incredibly fascinating! Being able to charge your iPhone, Pixel, iPad etc at once is so cool! Good for couples or family use. Okay, I cheated. This is not really a "gadget", but I loveee a good notebook! As a creative I find it much easier to flow your ideas on a piece of paper - be it pitching a creative brief for a client, or jotting down my list of priorities for the day - it's so much more satisfying crossing this off things with a pen than electronically ticking off! This post was sponsored by Catch.com.au. However, all thoughts are my own. Alright, I’ll admit it – with the temperature slowly rising, I’m finding it harder to get dressed. Don’t get me wrong, it’s quicker to get dressed (Exhibit A: this morning – threw on a slip dress and out the door I go! ), but it’s harder to dress ‘cool’. Winter fashion is amazing because you get to be creative with all the different layering combinations. However in summer, I find myself wearing the same items over and over again. Who can relate? I knew I needed to somehow elevate my summer style, so when Glue Store challenged me to pick out three things that I’d never normally consider wearing, I didn’t bat an eyelid. CHALLENGE ACCEPTED. Ahead, I’m breaking down three street style looks that got me out of a style rut – and I hope it does the same for you. Go for the matching top & bottom duo (…with a side of fresh oranges). I love how much of a statement it makes, especially with the graphic logo wordings all around the fabric (it says "You Can't Practice Attitude"). Would totally wear this out to party with heels! An alternative to wearing dresses – the IT-girl way. 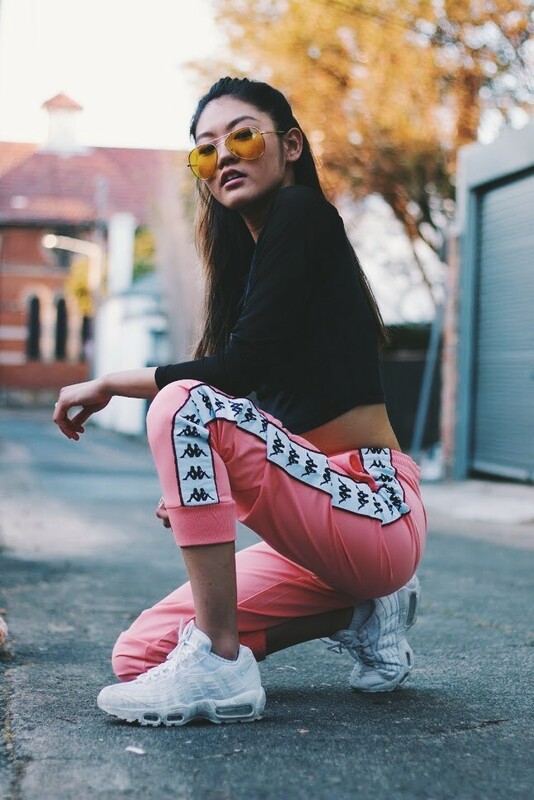 Throw on a pair of tracksuit pants, especially when Kappa is making a resurgence! I have never been in the trackies scene until I fell in love with these red Kappa pants. I’m now a convert. Kappa forever. Denim is everywhere this season. Try wearing a pair of cheeky bum cuts. They are making a comeback, as influenced by the swimsuit trend this season that’s focused on showing off your bottom assets. But make sure you’re covered up on top so it doesn't look *too* tacky. How are you elevating your style this summer?